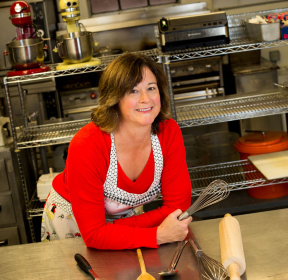 Angie’s Pantry Personal Chef Services….. I have been extremely busy getting myself ready to cook out of an amazing kitchen in River Forest. The kitchen is about 5 blocks from my house and is in this amazing business that caters to kids ages 5-18. It’s called Constructive Chaos. If you haven’t heard about Constructive Chaos, you must check it out! When you walk in all you can think of is FUN! The focus is on creativity in the teaching kitchen as well in the whimsical art studio. There is a separate room where they do theme parties. What I love most about this interesting idea is that Ashely teaches good nutrition and good basic cooking skills that will last for a lifetime. They built this beautiful kitchen with induction ranges for cooking. These are the safest cook tops possible when you’ve got kids in the kitchen. She has all the necessary equipment for each child to have their own work station, mixer and even mini food processor! Oh, and a beautiful convection oven, my dream! This is very, very cool! I feel so honored that I get to work out of this state of the art kitchen! Many business just starting out seek out rental time in established businesses with commercial kitchens. The tricky part here is to get in during a time slot that the kitchen is not being used and for a convenient time for me and my family. I want to work while my boys are in school. I am not a night person so evening would have been out for me. I have the most energy of the day in the morning. The timing here was perfect. Thank you God! I will be making nutritious and delicious meals to be delivered to Oak Park/River Forest clients. Most anything you see on my blog will end up on the menu from time to time. So much to do and so exciting! Thank you for your patience with my limited posting. I promise there will be more updates and recipes! Think Indonesian Quinoa Salad with peanut dressing…OH BOY!